Hot news from India is zipping around the world in the international press. First there is the persecution in Orissa. We wrote about that. Now there is a huge flood. Individuals are writing and asking how these things affect our trip. We are thankful that the outbreak of persecution has been contained within Orissa's borders. Things are slowing down, and yet there is much fear. The Christians closed their school doors on Friday and spoke as one united voice. May God be gracious and use that and our prayers to bring some resolve to the situation. Problems still exist, though. There are 6,000 Christians in special compounds. Where will they go? Many other thousands of Christians are living in the jungle due to fear. When can they go back? See the pictures on the right: church burnt, house destroyed, village decimated, and homeless Christians. The Gospel for Asia link below has been updated. It is worth watching. We are constantly watching the news. The north team will be visiting West Bengal State, bordering the north of Orissa. So far the hatred has not spread. The South team (See map below- Yellow circle) is to visit a place closer to Orissa. Again, each state is very differently run and there should not be a problem even though it looks close. Right now the report says 6 Christians have been killed and 125 Christian homes have been destroyed. Fifteen churches burned. I suggest you watch this report by Gospel for Asia (map from them) at the address below. Remember this is not a place where people have insurance! They need to run to the jungles for safety. A large river has gone over its banks and changed its path due to severe rains. It is creating a national disaster. Several millions are running for their lives. They have left their homes and crops. One brother asked how this affects our plans. We appreciate the concern. 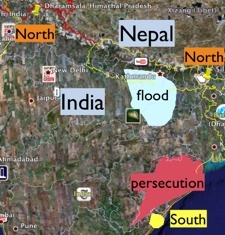 Right now, however, it seems that the flood region is in the central part of Nepal and the part of India just below it. See the map on the right. The colored regions are not accurate. We are going to both the west and east side of Nepal. The light blue represents the flood area. The red is the area of persecution in Orissa. The yellow pins depict where the north team is going (on left and right). We praise the Lord that more people are praying and more funding has come in. We are now up to 66% in our funding goal. Keep praying for the last sums to be provided. The north team (Keng and I) leave next Sunday (September 7th). The South trip (Pastor Ed and Philip) Leaves on Monday, September 22nd. It is interesting to note that among the four of us, we have 14 children. Pray for our families and ministries while away.